Travertine pavers are made completely from natural stone such as granite, marble, slate, onyx, and limestone. These pavers offer an incredible level of hardness that makes them highly suitable for use in hardscape projects such as driveways, outdoor steps, pool patios, pool decks, pool steps, outdoor fireplaces, and walkways. The standard size in travertine pavers is 1.25 inches in thickness. These pavers are cut from huge blocks sourced from quarries. 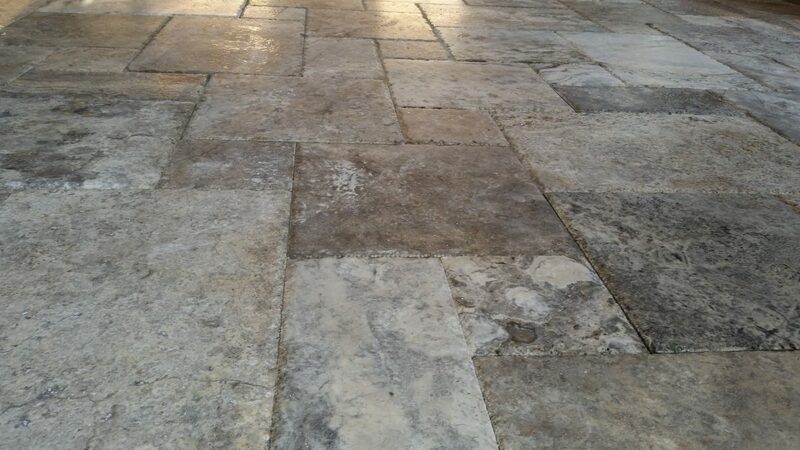 Each travertine paver is finished before it is installed using one of the following methods – polished, filled, tumbled, brushed, honed, filled and honed, and bush hammered. Much of the available supply in the United States actually comes from Turkey. In most cases, the grade assigned to the travertine determines how expensive it is. The majority of all travertine pavers feature the default cross cut, which is the standard for cutting at the quarry location. Natural veins in the stone are not visible with this cut. If you prefer to see the veins of the stone in your pavers, you’ll need to place a special request that will take much longer to obtain while also being more expensive. This style of paver is available in many sizes, giving home and business owners in Florida many options, including 4 by 8, 6 by 12, 12 by 12, 16 by 16, 12 by 24, 16 by 24, 24 by 24, and 36 by 36. Compact sizes are the most popular. Although the decision to seal your pavers is a personal one and certainly not mandatory, it does protect the integrity of the stone against the damage created by UV rays, pool water, and rain. Popular for a variety of reasons, travertine pavers are often used for outdoor projects. Hiring an experienced paver installer is important if you want to ensure the longevity of your paving project.